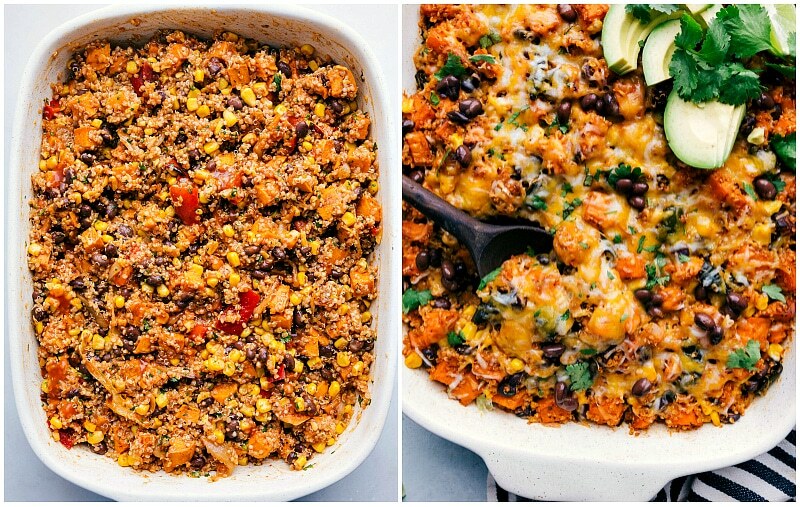 A delicious sweet potato, black bean, and corn quinoa enchilada bake is a nutrition-loaded casserole the whole family will love. While this dish is vegetarian, you won’t be missing the meat in this protein-loaded nutritious dinner! 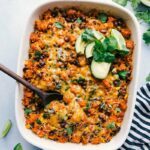 Pair this quinoa enchilada bake with a simple side dish such as this cucumber salad, this mandarin orange salad, or this Italian salad! Years ago I shared this healthy crockpot enchilada quinoa and to this day it’s still one of the most loved recipes on my site. Over the years I’ve been asked how to convert it from a slow cooker meal to a casserole and today I’m finally sharing how to do that. While this recipe isn’t an exact replica of the other dish, it’s quickly become a family favorite. The other recipe uses ground turkey and for this version, we’re using roasted sweet potatoes. If you or anyone you know is on the fence about a vegetarian meal, THIS is the one to serve 🙂 It’s incredibly filling and packed with protein from the quinoa and beans. It’s got so many good-for-you ingredients and my boys literally scarf it down everytime I make it! So let’s get started! First, let’s talk process. This dish takes a bit of upfront work, but comes together so easily! Roast the vegetables: onion, sweet potatoes, and red pepper all get oven roasted in olive oil and spices. 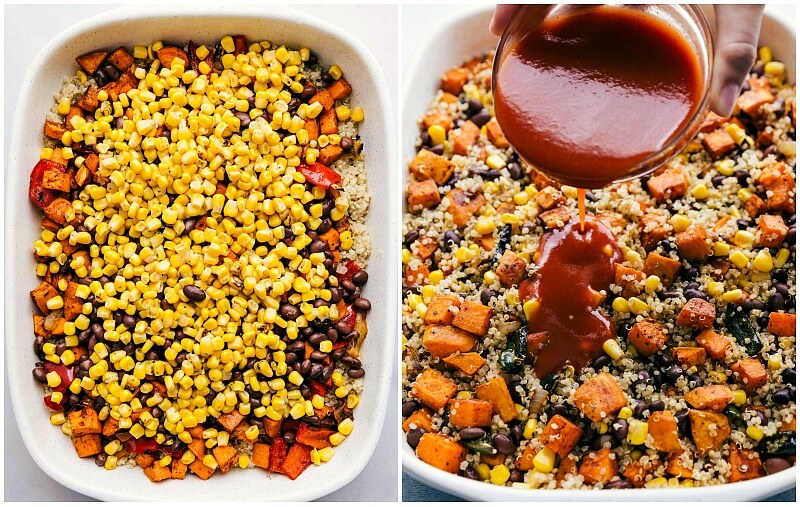 Assemble in a casserole dish: this is as simple as combining everything together in a large casserole dish: vegetables, quinoa, beans, corn, enchilada sauce, and cheese. Bake: stir everything together and bake! Top: add all your favorites to this quinoa enchilada bake — avocado or guacamole, sour cream, fresh lime, pico, etc! 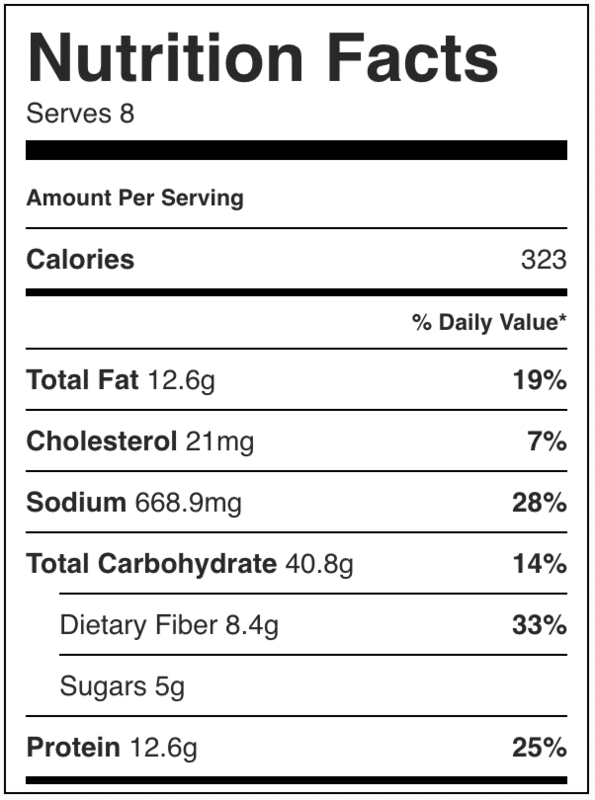 Below are a few ways to change up this healthy mexican quinoa casserole. To make this quinoa bake vegan: simply omit the cheese or use a vegan cheese! Since a lot of flavor does come from the cheese, if you’re leaving it out, make sure you have plenty of toppings! To make this meal dairy free: omit the cheese and make sure to add plenty of toppings! To make this meal gluten free: ensure the enchilada sauce you’re using is gluten free, as well as any other canned products. 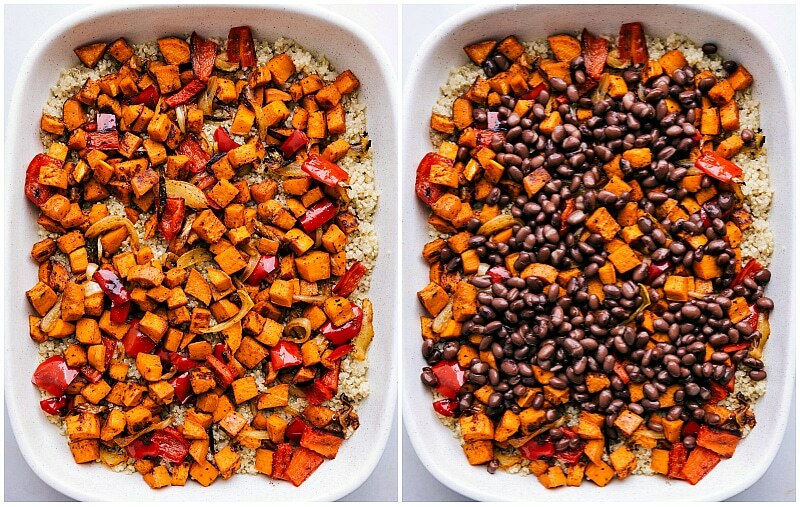 To make a quinoa enchilada skillet meal: microwave the sweet potatoes, remove the skin, and chop. Saute onion and bell pepper in some olive oil in a large skillet and then add in the sweet potato chunks. Add spices, black beans, corn, and cooked quinoa. Add enchilada sauce and cilantro. Stir and heat everything through. Sprinkle with cheese and heat until melted. Serve with your desired toppings! Add meat: brown some ground turkey, chicken, or beef and add it to this meal. Make sure to season the meat you use with salt, pepper, and any additional desired seasonings (such as chili powder, paprika, or cumin). Alternatively you can serve grilled chicken or steak to the side of this quinoa enchilada bake. You could also stir in chopped rotisserie chicken to this casserole before baking. Make it spicier: to increase the heat, add in a finely diced jalapeno. You can also use a hot enchilada sauce and bump up the chili powder! Switch vegetables: we’ve made this with a poblano pepper (roasted instead of the red pepper). Any pepper will work in this dish, but the red pepper did end up as our favorite! 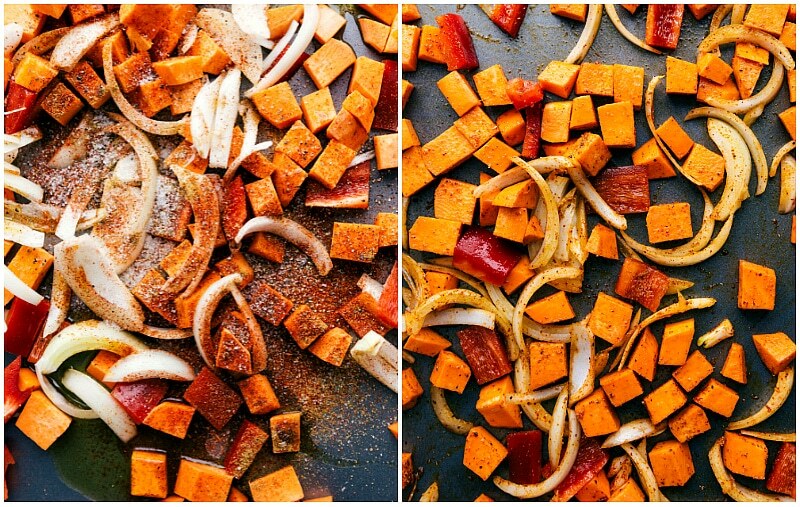 If you would like a replacement for sweet potatoes, you can increase the peppers and onions (3 peppers and 2 onions) in place of the sweet potato. 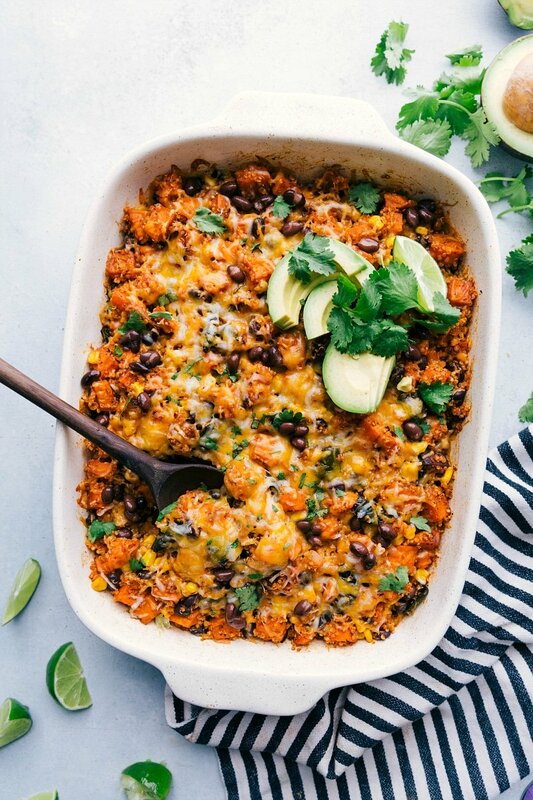 A delicious sweet potato, black bean, and corn quinoa enchilada bake is a nutrition-loaded casserole the whole family will love. While this dish is vegetarian, you won't be missing the meat in this protein-loaded nutritious dinner! VEGETABLES: Preheat the oven to 425 degrees Fahrenheit. Peel and chop sweet potatoes into small bite-sized pieces. Thinly slice the yellow onion and chop the sweet bell pepper. Put all the veggies on a large (full oven size) sheet pan or two half sheet pans. Toss with olive oil, cumin, garlic powder, 1 and 1/2 teaspoons chili powder, and salt and pepper (add to taste; we add 3/4 teaspoon salt and 1/4 teaspoon pepper). Place in preheated oven and bake for 15 minutes, flip and bake for another 10-15 minutes. Depending on size of veggies and the tray you're cooking them on (less space = longer cook time), you may need an additional 5-10 minutes. The potatoes and pepper should be fork tender and onions caramelized and very slightly crispy. Remove and set aside to slightly cool. Reduce oven temperature to 350 degrees F.
QUINOA: Meanwhile, add quinoa and stock or broth OR water to a small saucepan. Cook according to package directions and then remove from heat and fluff with a fork. Cover quinoa and set aside. BAKE: Cover the pan with foil and bake for 20-25 minutes. Remove foil, add remaining 1 cup of cheese and bake an additional 7-10 minutes, or until the cheese is fully melted. Remove from the oven and allow to slightly cool. Garnish with your favorites. Our must haves: chopped avocado, sour cream, chopped cilantro, and plenty of lime juice! We love this with tortilla chips too (eating it as a dip)!